especially here in Europe. Although Paris is the fashion worldcapital, innovative Afrian, let alone South African fashion at retail is almost non existant. The European global fashion industry’s success at large is mised on sameness and excessiveness. KNOW YOUR TARGET MARKET Decide who you are designing for. If your designs are handmade high fashion, Haute Couture, chances are you probably won’t grab the attention of a ready to wear, ‘Prêt-à-Porter international buyer. Haute Couture fashion is often deemed of the highest quality and highest price, therefore caters for a different market segment. Every Haute Couture piece is made to measure for a single client, based on customized measurements and fittings. This points to the fact that every Haute Couture piece is tailored to the individual client, both in style and size. Prêt-à-Porter collections on the other hand, are designed within the bounds of standardized sizing so as to fit the majority of the people fairly well. While Prêt-à-Porter collections range in price and quality, their overarching characteristic is that they are factory made and available to a wide variety of customers. Therefore, know who your target market is, then focus all of your energy on getting them to notice you. GET INTO THE HABIT OF SOCIALIZING Go to as many fashion events as you can. This seems obvious, and you have plenty of other things you need to be doing, but try to go to at least two fashion events a week. Introduce yourself and say you are a young and emerging fashion designer. Don’t over promote or sell when you meet them, just a friendly introduction will do, and over time, they will remember you. Be sure to follow them on social media. In addition, a comment on their facebook, instagram or twitter post is always appreciated and memorable. HAVE A PURPOSE Running a fashion label is not as glamorous as everyone may think. It takes hard work, focus, perseverance, determination, discipline, capital and resources, just to mention a few. So where does an emerging designer even start? With a unique perspective and an original idea. There’s no need to introduce another pretty dress into an already over saturated market. In order to stand out from the crowd, you must have a unique reason to exist beyond just designing pretty garments. By simply introducing yet another pretty garment, chances are you are going to struggle to compete with veteran designers who offer products that are already widely valued by customers. Hone in on your point of view and use it as a competitive edge to stand out. Remember that in the fashion industry, emerging designers get in the door for being different. And then once your brand is well established, you can then go ahead and make the pretty stuff. Because, then, you will have your name out there. HAVE A POINT OF SALE No matter how nice your website or editorial is online, the human experience still remains quite flat. When people come into your boutique and get to touch and feel the fabrics, that's how they understand your brand. It makes them connect more to your work. In Paris, France for instance, what counts the most for the majority of the fashion conscious, ethical consumers is the emotional connection with the story behind the brand. Look at your store as the best way for people to really get what your brand is about. It is an important tool you can utilize to raise awareness and increase brand visibility. Most importantly, a physical point of sale grabs the attention of the press. When journalists know where your products can be physically sourced, they are more inclined to write about you because your product is available. The stores bring the press and the press brings in customers. AVOID FASHION WEEKS By this, I mean do not invest too much of your limited resources and time on showcasing at a generic international fashion week. Unless you get accepted into an emerging designer group show, don’t even try to have an off site event or show too early in the early development of your label. These events are expensive and there’s no guarantee that you will make any sales. When international buyers walk into a show to buy apparel and accessories, more of often than not, they spend almost all of their money on designers that they already know and on lines that they either already carry or want to carry. This is not always the most popular opinion, and there is certainly a time for a show or presentation if you want one. But if you are investing too much time and money, especially if you cannot afford to hire show organizers, communications, marketing and public relations, showcasing or even having an off site event is not the best idea. Realize that International Fashion weeks are completely saturated with shows, so it’s very hard to get exhausted stylists and editors to the smaller, less marketed shows. Many overlap as well. Also it’s hard for editors and stylists to remember what they saw by the end of the week. And while editors do attend, stylists often don’t attend shows because they are styling shows. Realize as well that the concept of seasonal collections is starting to feel a bit old school. More and more, independent designers are thinking about the now, and are starting to get over the traditional fashion calendar. While still in its infancy, this shift in the way designers work could start to have an impact on the effectiveness of traditional fashion shows. BOOKHA CREATIONS Bokang Lehabe is a young South African creative born in the rural village of Ganyesa in North West province. Bokang holds a Bachelors of Arts in fashion design from Fedisa. He is at the helm ofBookha Creations, a boutique that focuses on the most current and emerging trends with a signature style that is highly detailed, modern and yet Proudly South African. He garners his influence from art and social issues affecting ordinary Africans. In 2015, he was announced the winner of PPC Imaginarium Award’s Fashion Category for his three pieces entitled “The Beast We Call Fashion”. Bokang has worked for several leading retail companies in South Africa. Africa, the pieces are made from materials sourced from local suppliers in rural areas. 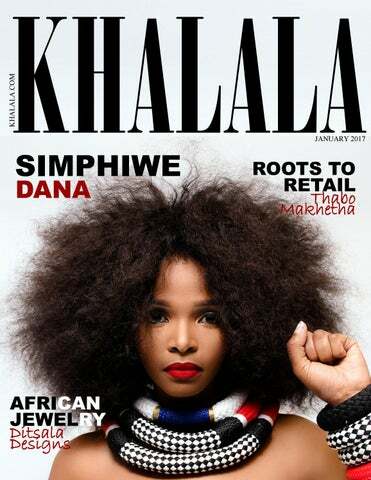 WOULD YOU LIKE US TO SEND YOU PRINT COPIES OF KHALALA MAGAZINE FOR FREE DISTRIBUTION AT YOUR ESTABLISHMENT?